It is an honor and a privilege for me to be elected as president of the Virginia Orthopaedic Society. Firstly, I would like to take this opportunity to recognize the contributions of our outgoing President, Quanjun “Trey” Cui. It was a pleasure to work alongside Trey and the rest of the VOS Board of Directors this past year. I feel as though we accomplished many things for our society and I look forward to the challenges that await us this year. I would also like to thank VOS past presidents: Jonathan Isaacs, John Mann, Mark Romness, and T.K. Miller. You have all served as role models, mentors, and friends during my formative years in VOS. Secondly, I would like to congratulate the 2017 program co-chairs, Drs. David Weiss and Winston Gwathmey on an outstanding annual meeting. The Boar’s Head Inn was an excellent location which we all enjoyed. Keynote addresses by Dr. John Clohisy from Washington University in St. Louis, and Dr. Andrew Burgess from the University of Texas in Houston were highlights of the meeting. The “Resident Quiz Bowl” was an immediate success. I am proud to see the VCU team consisting of Ashton Goldman, Paul Crook and Obi Ugwu-Ojo take home the inaugural trophy! 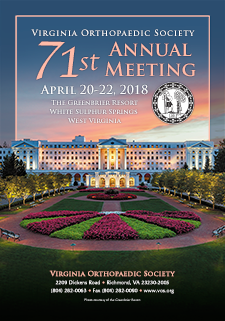 Our 71st Annual Meeting will be held at the beautiful Greenbrier Resort in White Sulphur Springs, WV, for the first time ever on April 20-22, 2018. 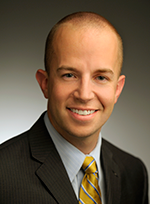 Dr. Alexander Vap from VCU and Dr. Brian Werner from UVA have agreed to act as program co-chairs. They will be assisted by Dr. Keith Bachmann from UVA, Dr. Brian Gladnick from OrthoVA, and Dr. Peter Apel from the Carillion Clinic. 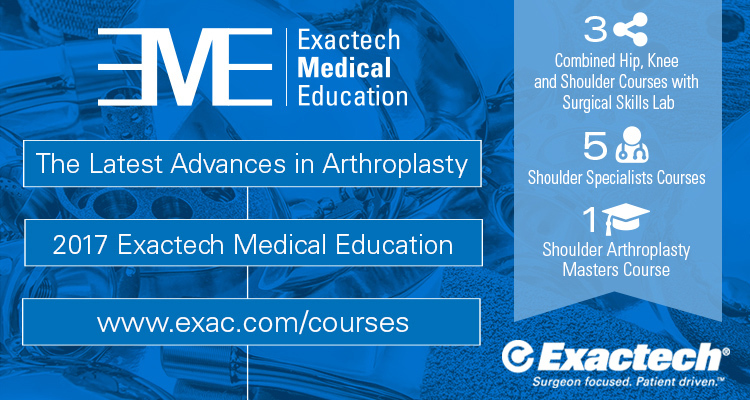 We promise to put together an educational program that will appeal to a broad spectrum of specialties and offer quality CME credit in a venue that is appealing to the whole family. As the newly-elected President of VOS, I promise to work hard for our members' behalf and interests. 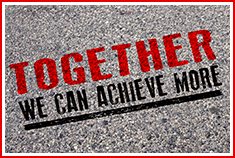 We understand that working together as a team is the key to success. As a Board, our goal over the next year is to increase membership. By the next annual meeting, we would like to have over 70% of board certified Orthopaedic Surgeons practicing in the state of Virginia to also be members of VOS. To accomplish this goal, we will be holding several regional dinners and also focusing on groups that are currently not members. We may be calling on you to assist in our recruitment efforts. 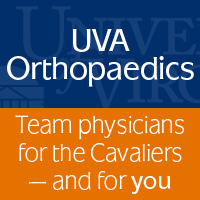 Our hope is that by working with the majority of our orthopaedic surgeons in Virginia, we can be more influential in overcoming the many obstacles during this challenging time in healthcare. From a legislative point of view, the VOS Board has actively participated in many activities that are imperative to the process for policy reform. Many thanks to our member and non-member volunteers who participated in White Coats on Call and committee hearings, in particular, Dr. Wilford Gibson and Cal Whitehead, our state lobbyist, for their expertise and efforts. For the upcoming General Assembly session, we will be focusing our efforts on COPN reform. A key to our success will be greater contribution to the OrthoPAC. We have had 100% contribution by the VOS Board over the past few years, but little help outside of this small group of members. To assist in this process Dr. Leon Costa has agreed to be the OrthoPAC chair. I fully realize we are asked to give money by an endless number of entities, but this is a chance to make a difference at the local level where change truly affects your practice. I am honored to act on behalf of our profession and membership in my position as President and look forward to continuing the political and educational growth of our Society. 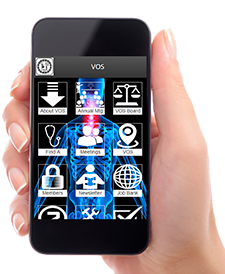 THE VOS NEWSLETTER IS NOW AVAILABLE ON YOUR SMART PHONE AND TABLET!